We are very excited to announce a new series of after school classes. Do you have an 8-12 year old who loves to explore, tinker, and take things apart? Bring your children to our after school classes and we will help introduce them to the maker movement. Our classes focus on hands-on, experiential learning that encourages children to become creators, not consumers. During this eight-week series of classes your children will learn to learn with their hands. 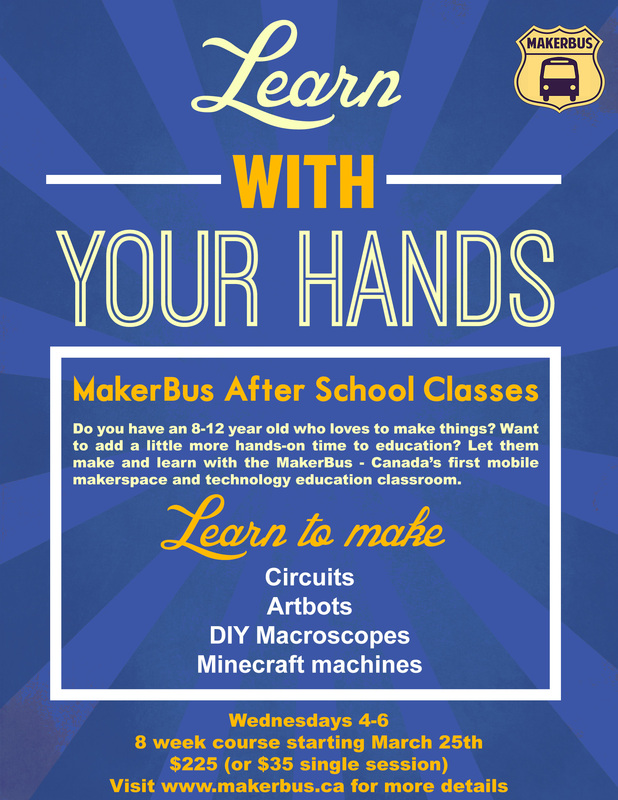 The MakerBus After School Classes begin on March 25th and end on May 13th. During these eight weeks child will learn about the maker movement and take part in hands-on workshops lead by the MakerBus team and a number of guest makers from the London community. What is Making? (Wed March 25th) – explore the maker movement and discover how you can learn with you hands. After receiving an introduction to the maker movement, children will have the chance to upcycle their own robot using MakeDo construction kits. Maker Fools Day (Wednesday April 1st) – Have some foolish fun with these DIY practical jokes! We’ll be making noodles from fruit juice, surprise cards, and a top secret take home prank! Introduction to Circuitry (Wed April 8th) – We’ll be exploring conductivity by creating LED throwies, penny batteries, and playing with the Makey Makey micro-processor. Lock Picking (Wed April 15th) – learn about the mechanics of locks and keys from a special maker guest. Children will have the opportunity to try their hand at picking locks. Brushbots (Wed April 22nd) – We’ll be learning how to make our own custom robots from an electric toothbrush! Postcards with Lefty Smudges (Wed April 29th) – Special guest maker and London artist Lefty Smudges will lead a workshop dedicated to the lost art of letter writing. Camera Antics (Wed May 6th) – We’ll work with portable cameras, microscopes, and macrophotography to test the limits of what we can show from a different point of view. ArtBot Adventures (Wed May 13th) – We’ll all work together to make robots that paint, and students can take home their own unique pieces of art! Classes are $35 for a single 2-hour workshop, or you can or register for all eight and save $55!. Classes are Wednesdays from 4-6pm and are held at VibraFusion Lab (355 Clarence St.). To register for a class, click this link. Payments can be made on our website or at the door.